Powered by the natural sunlight and no electricity cost or wiring need, our new Solar Laser Christmas Lights will project hundreds and hundreds of sparkling red and green lights in an instant! It's easy to install and turns on at dusk and off at dawn by itself, this outdoor laser light projector is ready to impress! There are 3 different light functions to choose - Steady Green Only, Steady Red Only, or Blinking Red & Green. 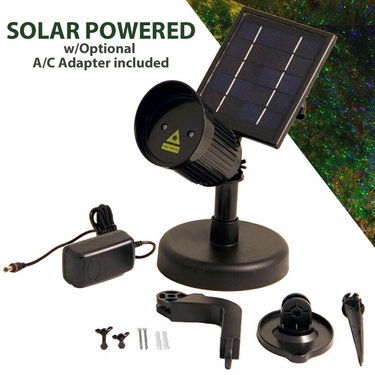 Ground stake and stand included - and get this, we're also including an AC plug that allows you to use it during those overcast days or in those perfect living in areas where sunlight is limited. That's right, this Christmas Laser Lights is BOTH Solar Powered OR A/C Powered! You can use it either way! It's easy to install and requires zero maintenance. No more climbing ladders, tangled messy wires and bulbs. Simply set it up, point it towards your house, walls or trees, and stand back in awe and watch your guest be mesmerized. Set it and forget it for an amazing display! Solar Powered. Optional A/C Adapter Included.